There are Adam Sandler movies, and then there are movies that happen to feature Adam Sandler. The former, the official kind, are the lowbrow star vehicles Sandler himself produces; they are directed—a term to be used as loosely as possible here—by guys like Frank Coraci and Dennis Dugan, and they often cast the SNL alum as some combination of sweet-natured everyman, short-tempered slob, and baby-talking simpleton. Movies that simply feature Adam Sandler, on the other hand, run a much wider spectrum—riffing on his star persona, as Punch-Drunk Love and Funny People do, or wedging him uncomfortably into dramatic roles, like the ones he occupies in Reign Over Me or last year’s Men, Women & Children. On a whole, the movies featuring Adam Sandler tend to be better than the Adam Sandler movies, if only by virtue of not being directed by Frank Coraci or Dennis Dugan. 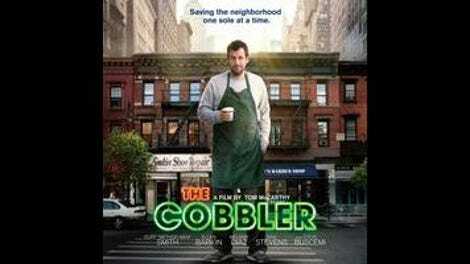 The Cobbler, the actor’s latest project, is an Adam Sandler movie disguised as a movie featuring Adam Sandler. Yes, it’s been directed and co-written by Thomas McCarthy, the respectable indie filmmaker behind The Station Agent, The Visitor, and Win Win. And yes, Sandler delivers one of his most restrained performances, playing not some bellowing clown, but a middle-aged Jewish bachelor who runs the business passed down to him by his ancestors. (Perpetually draped in an oversized overcoat, this withdrawn sad sack fits nicely into McCarthy’s growing roster of standoffish loners.) But no veneer of pedigree can contain the magical-realist hooey erupting from the surface of this high-concept comedy. What looks at first like some cross-borough cousin to The Visitor reveals itself to be Thomas McCarthy’s answer to Click—a film as crass, in its festival-friendly way, as any Happy Madison production. 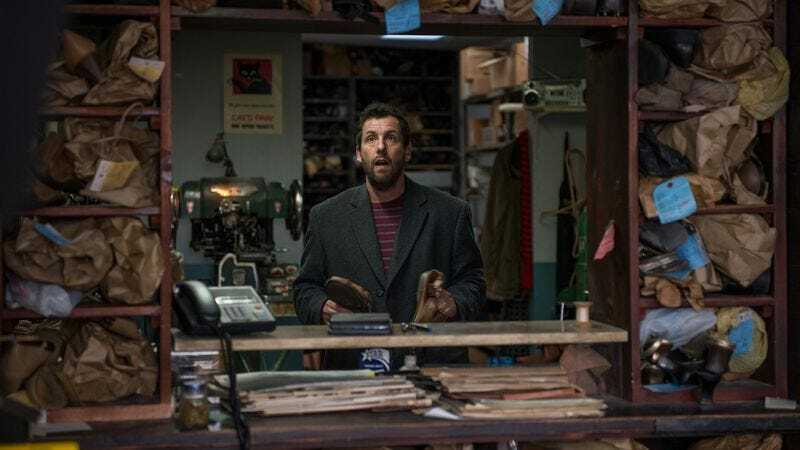 Set on a Lower East Side where the chatty locals are all played by familiar actors and a klezmer tune is always in the air, The Cobbler casts Sandler as Max Simkin, a lonely shoe repairman who lives with his ailing mother (Lynn Cohen) in Sheepshead Bay. One fateful evening, he trudges into the basement of his shop and uncovers a dusty old heirloom—a pedal-powered stitcher he uses to patch up a customer’s pair of expensive loafers. On a whim, Max slips on the shoes and is shocked to discover that doing so causes him to transform into the spitting image of their owner. In fact, any footwear mended by the magic device allows the wearer to assume the identity of another person. Soon, Max is capering across town, literally testing that age-old adage about walking a mile in someone else’s shoes. At first, Max uses his newfound gift to get into some fairly innocuous mischief, messing with the friendly barber (Steve Buscemi) who works next door and pulling a dine-and-dash at a fancy restaurant. From here, however, the high jinks get creepier and less savory. Take, for example, Max’s misadventures as the British DJ (Dan Stevens, from The Guest and Downton Abbey) who spins in his neighborhood. Only an inability to remove his magic boots stops our “hero” from taking advantage of the man’s unsuspecting model girlfriend—a near-violation the film dubiously justifies by making the Stevens character a closet case who doesn’t satisfy her needs. Theoretically sweeter, but almost as icky, is the fake reconciliation Max arranges between his mother and the long-estranged father (Dustin Hoffman) he briefly impersonates. Again, it’s a nice idea on paper, until one dwells on the Oedipal implications of pretending to be your dad to go on a date with your mom. Flamboyant caricatures and casual prejudice have always been cornerstones of the Adam Sandler empire, and The Cobbler is no exception. Indulging the star’s soft spot for putting men in dresses, the film scores a few cheap shots at the expense of a bulky cross-dresser whose appearance Max borrows. Even more risible is any and all material involving a local gangster (Clifford “Method Man” Smith). It’s bad enough that the only prominent black character in this New York story is an ugly stereotype, a violent neighborhood menace who steals from local businesses and knocks around his girlfriend. What, furthermore, are we to make of how Max takes the guy’s form when he wants to rob a rich neighbor of his sneakers, presumably reasoning that his black skin will make for an intimidating disguise? Maudlin when it’s not being offensive, The Cobbler belongs to that special class of comedy that seems to get worse with every new (mis)step it takes; the second half finds Max bumbling into a jokey miniature thriller, battling a corrupt real-estate tycoon (Ellen Barkin) with the help of a plucky community activist (Melonie Diaz, managing to wring some charm from a role that asks her to behave exclusively like a pushy canvasser and to fulfill the Sandler mandate of love interests nearly half his age). Eventually, the film arrives upon a ludicrous twist ending, one that gives mythic new meaning to the title and provides information that’s supposed to redeem one character but instead makes him look even shittier. If there’s anything to recommend about this colossal folly, it’s how the out-of-body scenes are handled: Rather than let its lead do impressions of the various strangers his character changes into, The Cobbler has members of the supporting cast do their best Sandler—a challenge the film’s hip-hop ringer best rises to, one squirm and stammer at a time. Too bad this is more of a movie that features Method Man than a Method Man movie.